Instant downloads of all 942 LitChart PDFs (including The Tempest). 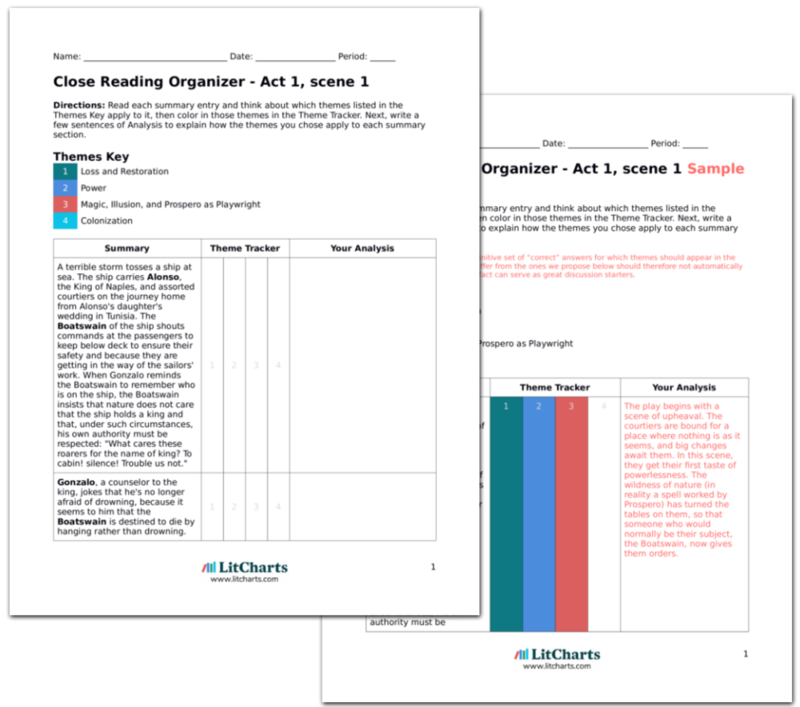 LitCharts assigns a color and icon to each theme in The Tempest, which you can use to track the themes throughout the work. The Tempest is full of Prospero's magic and illusions. The play begins with Prospero's magic (the tempest), and ends with Prospero's magic (his command that Ariel send the ship safely back to Italy). In between, the audience watches as Prospero uses visual and aural illusions to manipulate his enemies and expose their true selves. At nearly every point in the play, Prospero's magic gives him total control—he always seems to know what will happen next, or even to control what will happen next. At one point, Prospero even goes so far as to suggest that all of life is actually an illusion that vanishes with death: "We are such stuff as dreams are made on, and our little life is rounded with a sleep" (4.1.156-158). Many critics see Prospero's magical powers as a metaphor for a playwright's literary techniques. Just as Prospero uses magic to create illusions, control situations, and resolve conflicts, the playwright does the same using words. Throughout the play, Prospero often lurks in the shadows behind a scene, like a director monitoring the action as it unfolds. Prospero refers to his magic as "art." In Act 4 scene 1, Prospero literally steps into the role of playwright when he puts on a masque for Miranda and Ferdinand. In fact, many critics take an additional step, and argue that Prospero should actually be seen as a stand-in for Shakespeare himself. The Tempest was one of the last plays Shakespeare wrote before he retired from the theatre, and many critics interpret the play's epilogue, in which Prospero asks the audience for applause that will set him free, as Shakespeare's farewell to theatre. The ThemeTracker below shows where, and to what degree, the theme of Magic, Illusion, and Prospero as Playwright appears in each scene of The Tempest. Click or tap on any chapter to read its Summary & Analysis. Below you will find the important quotes in The Tempest related to the theme of Magic, Illusion, and Prospero as Playwright. Fogt, Lis. "The Tempest Themes: Magic, Illusion, and Prospero as Playwright." LitCharts. LitCharts LLC, 22 Jul 2013. Web. 11 Jan 2019. Fogt, Lis. 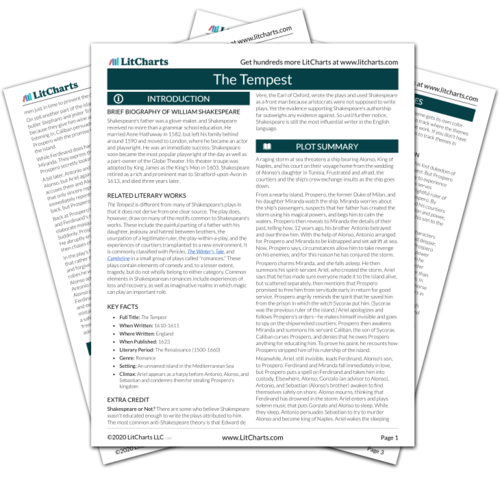 "The Tempest Themes: Magic, Illusion, and Prospero as Playwright." LitCharts LLC, July 22, 2013. 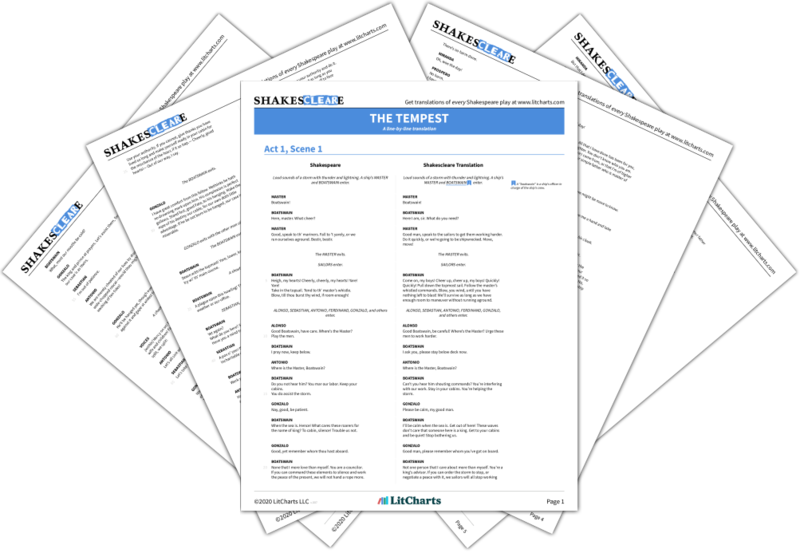 Retrieved January 11, 2019. https://www.litcharts.com/lit/the-tempest/themes/magic-illusion-and-prospero-as-playwright.